Installation view: Héctor Fuenmayor, Citrus 6906 (Originally Amarillo Sol K7YV68, 1973–2014). Dimensions variable. Colección Patricia Phelps de Cisneros (CPPC), Caracas and New York. Hunter College Art Galleries, 2014. Photo by Louis Chan. Citrus 6906, by Héctor Fuenmayor (born 1949, Caracas, Venezuela), challenges assumptions about how works of art are created and displayed. While the work brings to mind monochromatic painting and the symbolic meaning of yellow in the western tradition—light, warmth, and luxury—it also questions our conventional understanding of art because it is a work that can be executed by anyone, anywhere. The only materials necessary to make it are yellow paint and gallery walls. Even its title—Citrus 6906—is unstable. 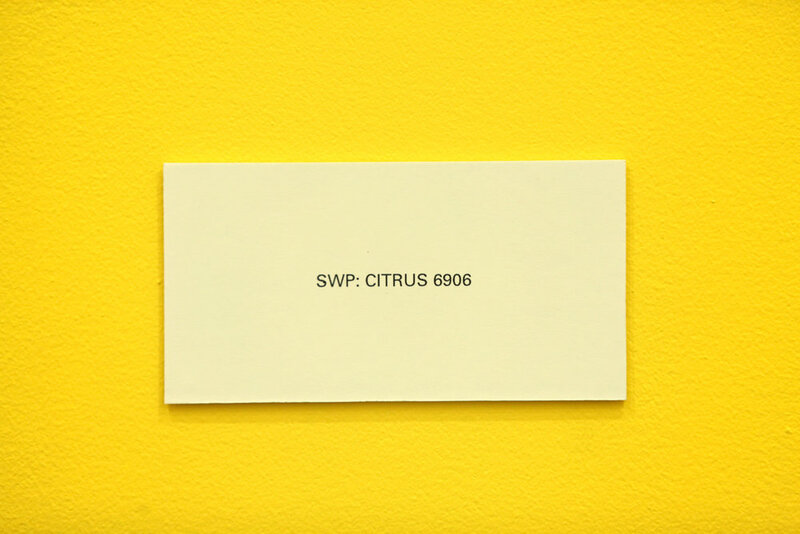 Originally called Sunshine Yellow KYV68 after a patented color in the Sherwin Williams’s product catalog, Fuenmayor changed the name of the work to Citrus 6906 when the company decided to rename its particular yellow hue. When it was initially installed in 1973 at the experimental gallery Sala Mendoza in Caracas, Citrus 6906 challenged prevailing trends in Venezuelan art of the 1970s: the embrace of material technology and geometric abstraction. In a context where abstract, colorful sculpture and murals were commissioned by the government and corporations to embellish Caracas’s modern urban environment, Citrus 6906 playfully confounded this enthusiasm for modernity. Citrus 6906 invites multiple interpretations. Although Fuenmayor created the installation prior to his study of Zen Buddhism in the early 1980s, it relates to his subsequent spiritual practice. Citrus 6906, he has said, “has strengthened in me the idea of ‘previous life data.’ ” The methods of Buddhist meditation Fuenmayor has practiced include Guru Yoga in Tantric Hindu and Guru Yoga Tantricism in the Tibetan tradition. As an object of meditation—a unicolor Mandala—Citrus 6906 asks the viewer to focus his or her effort (sadhana) on abandoning the intellectual habit of perceiving forms as objects and emptiness as vacancy. Confounding the difference between emptiness and form, Citrus 6906 shows us that color is neither contained in a space, nor applied to the surfaces of its walls. Instead color constitutes the substance of space itself. Since the early 1970s, Fuenmayor has created conceptual works employing painting, drawing, installation, and photography. He studied art at the Cristóbal Rojas School of Visual and Applied Arts in 1966, and had his first solo exhibition in 1973 in Caracas, showing there regularly through the 1970s. His work has been exhibited at the Fifth Havana Biennial, Cuba (1994); the Blanton Museum of Art, The University of Texas at Austin (1997); the Americas Society, New York (2005); and CIFO, Miami (2007). Fuenmayor’s works are in numerous collections including the Colección Patricia Phelps de Cisneros (CPPC), Caracas and New York; the Galería de Arte Nacional, Caracas; the Museo de Arte Contemporáneo de Caracas; and the Fundación Museo de Arte Moderno Jesús Soto, Ciudad Bolívar. Citrus 6906, included in the Colección Patricia Phelps de Cisneros was recently shown in 2013 as part of the exhibition La Invención concreta: Colección Patricia Phelps de Cisneros at the Museo Nacional Centro de Arte Reina Sofía in Madrid. The exhibition is made possible by the generous support of Colección Patricia Phelps de Cisneros.